The information (content) on the PROMEDICA Dental Material GmbH website is protected by German copyright law. PROMEDICA Dental Material GmbH authorizes the download of any displayed content only for private non-commercial use. Any copy of the content has to specifically mention the copyrights of PROMEDICA Dental Material GmbH. The content may not be changed and may not be used on other websites without prior written permission by PROMEDICA Dental Material GmbH. The content may not be copied, displayed, distributed or used in any other way for public or commercial purposes. Any violation of these provisions requires the immediate destruction of any content printed or downloaded. For such cases PROMEDICA Dental Material GmbH reserves the right to claim further damages. Any download is conducted at the sole risk of the user. PROMEDICA Dental Material GmbH, to the full legal limits, does not assume any responsibility for any damage which might result from the installation or use of software downloaded from this site. Although this site is continuously scanned for viruses, PROMEDICA Dental Material GmbH does not assume any responsibility for damage through computer viruses to the full legal limits. The information provided on this website is selected with great diligence. However, PROMEDICA Dental Material GmbH does not assume responsibility for its completeness or suitability for certain purposes. Using information provided on this website is at the sole risk of the user. PROMEDICA collects information that is sent to us automatically by your web browser. This information typically includes the IP address of your Internet service provider, the name of your operation system and the name and version of your browser. The information we receive depends on the setting on your web browser. The information provided by your browser does not identify your personally. We use this information to create statistics that help us improve our sites and make them more compatible with the technology used by our Internet visitors. 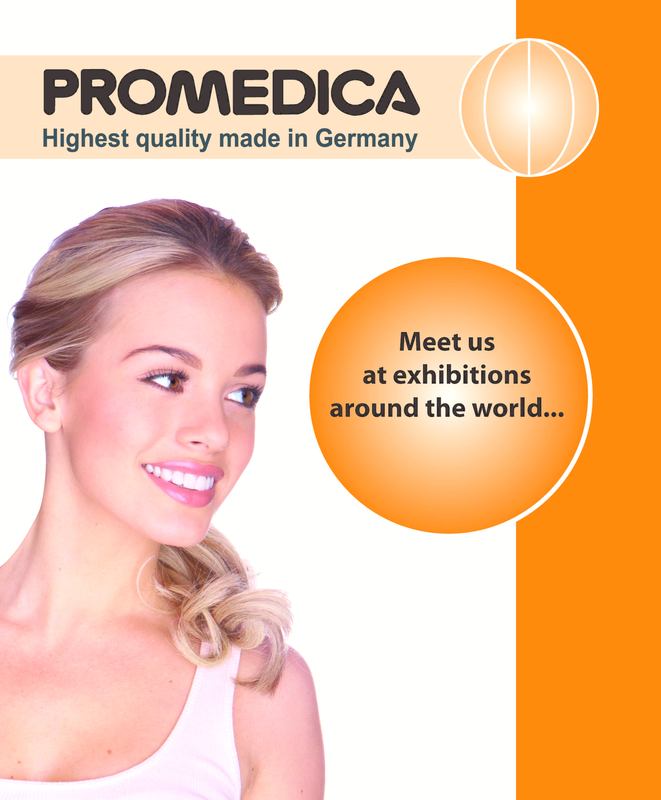 PROMEDICA Dental Material GmbH / Neumünster, Germany is the proprietor of most brands and trademarks shown on the PROMEDICA Dental Material GmbH websites. Third parties are not allowed to use or display these brands, trademarks, logos and labels. PROMEDICA reserves the right to update or modify this policy, at any time and without prior notice, by posting the revised version of this policy on our internet sites. We also reserve the right to update or modify your Country or web site privacy statements, at any time and without prior notice, by posting the revised privacy statement on the applicable PROMEDICA internet site. If we modify this policy or any privacy statement, the modifications will only apply to the personal information we collect after we have posted the revised policy or privacy statement on the applicable PROMEDICA internet site.